Now that Thanksgiving is over, it's safe to say you're starting to think about your Christmas tree. 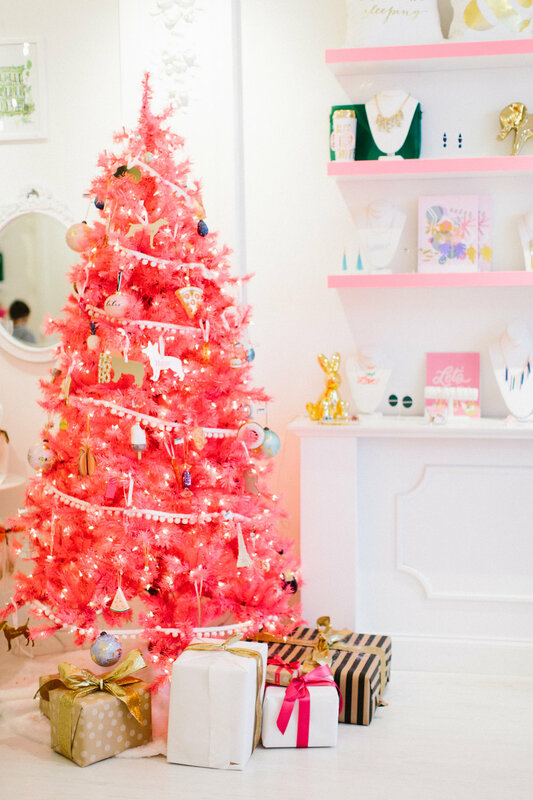 If you're going faux when it comes to your tree, you can't go wrong with pink or white! I love that this retro style has definitely had a resurgence the past couple of years. Thank you for shopping through the following affiliate links that help earn me a small commission! If you're going with a pink tree, you can use silver, gold, white, or even light aqua for your decor. I love how the white pom pom ribbon pops against the hot pink. The trees shown here are from Skinny Dip & Moon & Lola. Don't they just make you so happy!? The white tree here is from our balloon shop, Cannonborough Collective. Local artist Jenny Batt helped us decorate it with these rainbow colored ornaments and a vintage pink tassel garland. I think this colorful tassel garland would work well, too! Tag me at @CharlestonWeekender if you have a colorful tree this year- I'd love to see! Don't forget that I'll be sharing my Christmas gift guide on my Instagram December 1-12, so I hope you'll follow along. I'll be giving away a bunch of the products I'm featuring!